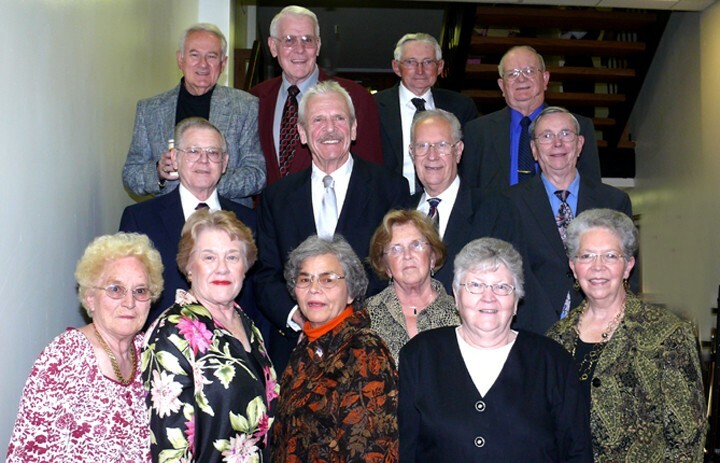 October 3rd, 4th & 5th, 2008 in West Virginia was the setting for the 55th reunion of Welch High School Class of 1953 at Pipestem State Park Resort. It was a great fall day on Friday as classmates began to arrive. Several last minute cancellations kept the group to a very small number. Speaking of small numbers, after the registration letter was sent out we felt we needed to make some contacts with classmates. Some of the committee members made phone calls trying to encourage better attendance. A lot of time was spent and was enjoyed by those doing the calling to make some last minute contacts. However, it did not change the numbers. A special effort was made to identify and find classmates who for whatever unfortunate reason did not graduate with us and extend them an invitation to join our reunions. Nancy (Curry) Rose is one we found—quite by coincidence through Anita Martin—who accepted this invitation. Nancy went to grade school at Maitland-Superior and about two years at WHS. We still consider her a classmate and were very glad to have her with us. Nancy has expressed her appreciation and enjoyed the reunion greatly. Friday evening we met for our first event, which consisted of dinner and some great music. As usual Anita Martin provided the most beautiful table decorations of large straw bonnets with fall flowers, beautiful ribbons and mints along with program for the evening event and a listing of events occurring during the weekend in the area. Marilyn (Wood) Lackey welcomed the group and gave the invocation in the absence of Jimmy Belcher. The group enjoyed a scrumptious picnic buffet catered by Pipestem. Our guests and classmates enjoyed a table filled with memorabilia from our high school days. John Walker introduced Cooney Hendricks and his sister Florence from Vivian. They are long time friends who were always available to attend sporting events, rescue John from college and just all around friends for many years. Cooney graduated in the late 1940’s. Bob Martin introduced John Yates and the Caravan Band, which included Calvin, BJ and Leon along with Lynn Yates, Calvin’s spouse and BJ’s fiancé. The music was great and all enjoyed the fellowship. Some of the Big Creek Class of 1951 who were celebrating their reunion stopped by to hear the music. The beautiful table decorations were given throughout the evening as door prizes. The band opened with John Denver’s “Country Roads” and later a recording of the state song “The West Virginia Hills” which we attempted to sing, in honor of us West Virginians. Saturday morning and afternoon was free time and some went to McDowell County, Princeton, Athens or just hung out at Pipestem, walking, talking to classmates and setting up for Saturday night’s banquet. Saturday at 5:30 pm the group met to have a group picture taken by photographer Jim Graham. All fourteen classmates were there for the group photo. Jim also took individual pictures for those who wanted them. The tables were decorated with fall bouquets, white vases with a red rose and blue and silver ribbon. The program was decorated with class colors, class flower and class motto. Bob and Anita Martin’s daughter Lisa Allen made a beautiful and most delicious cake. The cake (see picture below) was decorated with the Welch High School seal, Class of 1953 and our class motto, Onward Ever, Backward Never. The invocation was to be given by Betty Jo (Richardson) Abbott, Ron’s widow. Betty Jo was unable to attend because her daughter’s battle with cancer had just been diagnosed as making a turn for the worse and she was going with her to John Hopkins Hospital. Jimmy Belcher offered the blessing for the meal. The Saturday night banquet was a Pipestem catered sit down dinner thoroughly enjoyed by all. Cards were passed around to be signed by classmates for Onie (Crabtree) Kosmos, Wilma (Wilson) Kelly and Betty Jo (Richardson) Abbott. The class of 1953 has had six reunions – 20th in 1973, 50Th in 2003, 2004 and 2005 were in conjunction with the classes of 1954 and 1955 celebrating their 50th, 53rd in 2006 and the 55th in 2008. Those classmates who attended all six are Bob Martin, Tommy Jones, Bill Shaw, Alice (Mayhew) Shaw and Lakey (Schwartz) Logan. Those attending five of those reunions were Ron and Betty Jo Abbott. A booklet of the 20th reunion held in 1973 was given to Franklin Reeves for finding the (intended) mistake in the program for the evening. A memorial was conducted by Lakey (Schwartz) Logan to honor our 40 deceased classmates—copy separately attached. Those who had traveled the furthest for many years to all the other reunions: Alice and Bill Shaw. The group voted to accept 2 people into the class of 1953 as honorary members. Anita Martin ’57 because of the help she has given to the committee in planning each reunion. She has been a tremendous help with her ideas and talent. Anita was given a gift from the class as a token of our appreciation for her help over the years. Betty Jo (Richardson) Abbott ’54 for her interest in her late husband Ron’s class. She was always with him at the reunions, helping set up, taking pictures and sharing memories. We had expected her to attend this reunion but at the last minute she was unable to be with us. She said when she registered “Ron would want me to be there”. We had planned to honor her at the reunion. Discussion concerning future plans for our class reunions was held. Class of 1952 had asked if we wanted to join them September 24th - 26th, 2010 for our next reunion. After some discussion the class voted to join the class of ’52 in 2010. More information will be available later. The beautiful table decorations were given as door prizes. Each person was able to take a white vase and the red rose home, as well as many left with flower arrangements (See picture of Jim Belcher and his winnings below). Marilyn (Wood) Lackey showed a framed program of the 1952 Welch Maroon Wave VS Gary Coaldiggers football game. In 1990 Bill and Marilyn Lackey’s son Michael became the general manager of a new Sports Bar and Restaurant in Little Rock, Arkansas, called “Jock’s”. The program was on the wall and because there was so much there, Michael had never paid attention to the program. One day his brother was in the bar and looked at the program and said, “Look, here is Dad’s name.” (Billy Lackey). They couldn’t believe what they were seeing. Bill Lackey had lived in Little Rock for several years prior to his death in a plane crash in 1985 but it is unlikely he ever had the program. When the bar and restaurant closed, Michael kept the program. This year he knew that his Mother was going to a WHS reunion and brought it to her. It remains a mystery how such a thing got from Welch or Gary, WV to Little Rock and so many years later. Bob Martin has the 1953 yearbook that was dedicated to Eva B. Marchitelli. At the 20th reunion in 1973, Miss Marchitelli had the book there and those in attendance had signed the yearbook. When Miss Marchitelli died the family started selling her belongings. Glenna (French) Mullins came by a roadside sale, saw it and purchased it. About 2000, Glenna gave the yearbook to Bob for safekeeping. Now Bob wants to know what should be done with the yearbook. Breakfast was enjoyed on Sunday morning and then classmates began to make their way back home after a glorious weekend. We would be remiss if we did not mention the dedication of Bob Martin to the Class of ’53 for being the determining factor in putting together all of the reunions for us. Without Bob (and Anita), our reunions would not have been so successful. Bob has been the person who has researched and kept the records for the class. He has organized and planned the reunions, done the mailings—in fact he has done it all. We are just so happy that Bob has found another job—although the pay isn’t great—since his retirement. THANK YOU BOB!! “Time, time where does it go? I do not have enough time for that! How many times do you and your friends make these statements during the course of a day? Yet we all have the same amount of time – 24 hours each day. It is how we spend our time that really counts. We are here tonight celebrating 55 years of time since we graduated from high school. Our time is still ticking – but for some of our classmates time on earth has stopped. So let us take a small amount of our precious time tonight to remember those who were our classmates through grade and high school. I would like to light this candle as a symbol of the time the following spent with us and please light the candles on the tables one for each class member. Ronald Franklin Abbott, Buddy Bell, Sarah Lou (Meade) Boyd, Betty Joyce (Janney) Bullock, Charles Ira “Sonny” Bunting, Evelyn May (Eichert) Burnette, Frank Camden, Douglas Eugene Christian, Barbara Jane (Duncan) Davis, Bobby L. Doss, Robert Oakey Douglas, Elizabeth (Burton) Drees, Jacky Ransone (Kent) Foutz, Raymond Elwood Goins, Shirley Ann (Williams) Gunter, Thomas Cleveland Hale, Shirley Fay (England) Kitts, William Herbert Lackey, Edward John Larese, Robert Little, Ann (Hodges) Long, Jack Long, Anthony Charles “Tony” Lucion, Joyce (Phillips) Lynch, Donald Gene “Corky” Miller, Vera (Cortez) Mitchell, Glenna Marie Mulkey, Glenna (French) Mullins, Ruth Maxine (Evans) Piercy, Claude M. Piercy, Jr., James Polce, Alice Mae “Patsy” (Clark) Rakes, Norris C. “Pee Wee” Rhodes, Zalman Josel Scherer, Fred R. Spinella, Donald Sprat, Maxine (Bukovich) Visser, Patricia Lucille (Grass) Williams, Crystal (Smith) Wilson, William Webster Whyte. Those having passed on since our last reunion in 2006 were Ron Abbott, Crystal (Smith) Wilson and William Webster Whyte. And now a moment of silence.